Bike parking in busy cities can often be a nightmare, with lack of convenient space posing a problem for bike commuters. And then there’s the issue of your cycle being open to the elements… and the attention of thieves. 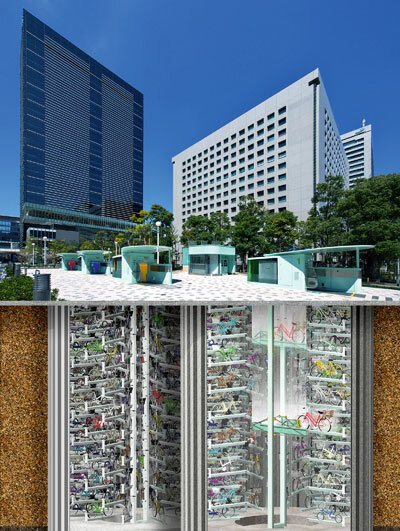 Few cities are as busy or have as little space as Tokyo, Japan, and so they came up with a solution to storing hundreds of bicycles: they went underground. But rather than using a ramp for you to ride down, as with an underground car park, you place your bike into an automated booth, which transports it into the below-street store via a lift mechanism. The bicycle is then stored safely along with around 200 others. The machine remembers which was your bike via a tag so that when you want it back, you give the booth your code and it brings up the right machine. The Eco Cycle stores are made by Giken Ltd and it costs around 30p a day to park your bike.